“No it’s not, to be called a salad, there has to be more green things in it!” She replied. So my friend’s a bit of a greeny and can’t live without her leaves, but doesn’t make the potato salad any less delicious or any less of a salad. I actually felt that when I was in Japan as well where meals that come with sides are either this Japanese potato salad, or piled up shredded cabbage with wafu dressing. Perhaps it’s because other veggies cost more or because they just taste better. The Japanese potato salad is a very creamy salad with a lot of slightly mushed up potatoes, various veggies and the Japanese mayonnaise. So what’s the difference between Japanese mayonnaise and western mayonnaise? It’s no where near as sweet (in fact, it’s closer to savoury than sweet) and richer and creamier. You can purchase them from any Asian grocery store or even your good local supermarket might have it. This salad is quite addictive, you can have it as a side to a meal or as a main which would be pretty carby though since it’s full of potatoes. Since it’s so easy to make, it’ll a good option if you’re short on time or have a busy schedule. After the meal, I realised that I hadn’t actually taken a photo of the ingredients! Silly me. I will post one up next time I make it. Question time: Do you like to eat leafy salads or the carby salads like this one? A creamy potato salad that's great a side dish or as a main. Wash and peel the potatoes and then cut them into small equal sized chunks. Boil a medium pot of water, put potatoes inside and boil for roughly 10 minutes, or until a chopstick (or a skewer) can go through the potato easily without it falling apart. Drain the potatoes and dry heat them for a further minute to get rid of the moisture. Mash them up slightly with a fork. Cook the egg in a pot of water until cooked through. Peel and then mash it up in a small bowl. Put the potatoes, egg, cooked carrot, cucumber and ham in a large bowl. Add enough mayonnaise to lightly coat everything and add salt and pepper to taste. Add the tomato as garnish. *I accidentally left out the carrots from this dish (they were sitting on the counter) and added in sweet corn instead. The corn was for a different dish I was making, silly me! But the salad still turned out great so corn is a great substitute and easier to prepare as you can just use frozen ones. I like both kinds of salad. I’ve never had Japanese Potato Salad. Can ‘t wait to try this! 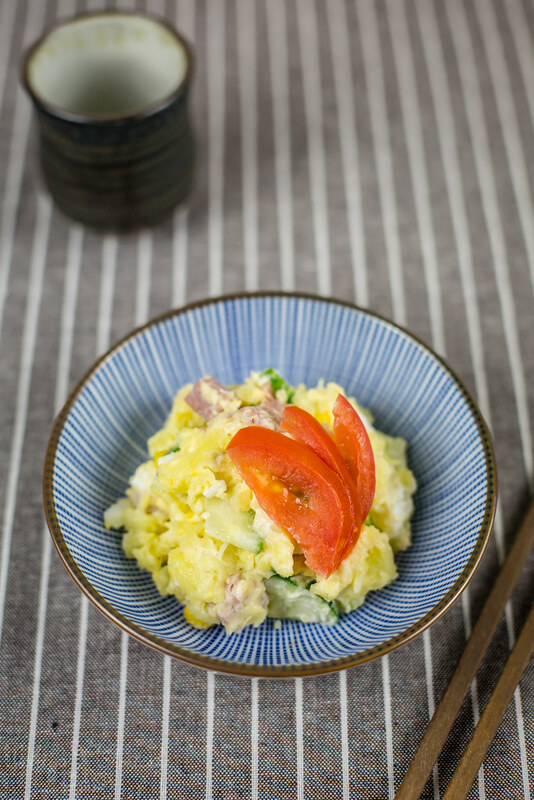 I love this potato salad…there is a touch of sweetness using Japanese mayonnaise…great meal! I do love potato salad, in fact we had it with dinner! But I also surprisingly like leafy green salads. To me potato salad isn’t really salad, but more of a side dish. You are on a roll with the most gorgeous recipes lately!